LG beat out HTC by seven days to win the race to launch the first glasses-free 3D enabled Android handset. The Korean based manufacturer today released the LG Optimus 3D while the HTC EVO 3D is set to launch on June 24th as we have reported. In its press release, the Korean manufacturer touts the "tri-dual architecture" of its phone meaning it has dual-core, dual-channel and dual-memory., All you really need to know is that this is supposed to make the phone perform better when multi-tasking, watching video, or playing a graphics-intensive game. [img right []:"The LG Optimus 3D features glasses-free 3D images" /]3D content is supported without the need for special glasses. The effect can be seen easily on the device's 4.3 inch WVGA display. The dual 5MP lenses on the back capture video at 1080p for 2D and 720p for 3D. The power for producing the 3D effects comes from a 1GHz TI OMAP 4 processor.For some reason, LG has decided on 512MB of RAM and Android 2.2 out of the box, although an upgrade to Gingerbread is likely. 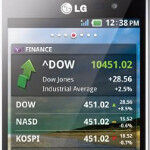 A number of special 3D features and applications are available for LG Optimus 3D users. A dedicated 3D YouTube channel (www.YouTube.com/3d) allows 3D video to be uploaded and streamed. As we told you, LG and Wikitude have combined to offer the globe's first 3D Augmented Reality browser which can be downloaded as an app from LGWorld (www.lgworld.com). The LG Optimus 3D will be on sale originally in Europe and over the next few weeks, the phone will be available in over 60 markets. As you might have read right here, it is expected to be launched in the States later in the year as the LG Thrill 4G on AT&T. Stop f*ckin around LG. Didn't this get announced back at CES? Who cares 3D isn't going to be good for atleast another 5 years. It's a cool idea but I'm not impressed that lg is the first to make a phone with a really cool premise but doesn't have the technology to make it good enough to work. Plus the Interfance is bad so why would I want one. Why waste money tO get the first 3D phone. you're an idiot. have you seen the phone? read the specs? who cares about 3d.. that can be turned off. The phone itself is a techno-monster. its the first with dual core memory which can cure one of the biggest bottlenecks on phones. Computers went this way a long time ago and its as big of the reason for huge computer gains as the dual core processors. And its the same premise. 2 information streams can process more than 1 stream. If this phone cant keep up with the SGS2 or maybe even beat it on some benchmarks I would be highly suprized. It might be the first 3d phone to hit international soil, but the Evo 3d will be the first to hit U.S. soil which concerns me more than something be launched in europe and is gsm anyway. If its like other LG phones it is only going to be high-tech for bout a couple weeks before someone has an issue with the display, the camera, memory card reader, and the list continues. Most of LG's handsets all have some of these problems at sometime, that is why I am looking forward to the Evo 3d. Its got a solid manufacturer, awesome UI, and always has so much dev support for custom roms when the time comes. To be first is already a record. As for build quality (looks) and UI (looks again), it's not all about the looks. Good looks also don't mean a victory is won. Yeah it might be the first but Evo 3D will be the best! the evo 3D uses the weakest dual core processor out right now (scorpion dual cortex A8) and only single memory where the LG uses a more advanced processor (OPAP cortex A9) and dual channel memory. The information output by the LG will be exponentially faster. so, as far as looks and use of tin, the HTC will be better. As far as battery life and power the LG should smack it down pretty quickly. They should have used Stock UI.